20 line Video Slot game with exciting wheel of Cash bonus round! EGT have delivered an excellent video slot in Lucky and Wild. 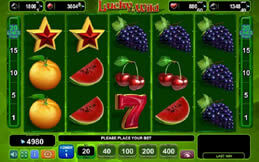 Players will notice the usual slot symbols but Lucky and Wild also features some different symbols by introducing a four leaf clover and a golden horseshoe. The Golden Horseshoe is the wild over riding all other symbols greatly improving your winning chances. There are two exceptions to this, firstly the Star, which is a Scatter, and can be displayed on any reel anywhere. Some excellent Multipliers are awarded, ranging from x5 going up to a fantastic x200. A maximum bet of 400 credits will deliver 80000 credits!! The Clover symbol only appears on reels 2 and 4 and when they do they take over all other symbols on that line and function as Wilds – the win potential is fantastic. The EGT icons are presented in 3D and are vivid in detail and a pleasure to play. Lucky and Wild is a straight forward game and although there are no special bonus games the win rate will prove it a worthwhile slot.